If you want to get a modem rather than rent one, you will first need to know the break even point of buying over renting. When you have decided to get the modem, then it becomes time to decide on which modem to get. This review will concentrate on the D-Link DSL-2320B because we think it is the best option. All of the basic features that can be noted on a DSL modem can also be observed on a D-Link modem. The typical features are an RJ-11 ADSL port, fast Ethernet port, a reset button and light-indicator to display the connection status. The D-Link DSL-2320B has a few options that the competition does not have. The D-Link DSL-2320B has support for VPN, the option to plug in via USB and essential network security features. Malware and denial-of-service attacks can be detected and terminated by the technology supported by the firewall. The firewall will refuse any traffic that it decides is suspicious traffic. VPN or Virtual Private Networks are essential for corporate telecommuters, by allowing communication to take place between employees and consultants. There is no reason to want to utilize a USB port over an Ethernet port, but this D-Link modem comes with the option to do so. Think of the USB port as a last resort because all modern PCs come with Ethernet ports. If you opt to utilize the USB port to plug in your PC, you won’t be able to use it for something else. In addition, you will not have the ability to set up a router, or share the internet connection. The USB connection can also be undependable since it has the tendency to drop connections more and the cable is limited to up to 20 feet while Ethernet cable can reach up to 300 feet. The modem has a tool for user-friendly configuration, and settings can easily be modified with a web-based user interface. The light indicators on the D-Link DSL-2320B is very useful to see the status of your Internet connection. As this modem complies with the TR-067 standard, it can manage and update settings automatically. In addition, the D-Link DSL-2320B follows the ADSL Interoperability Test Plan. 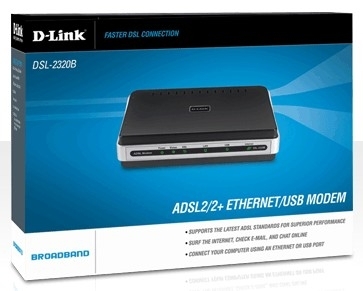 The D-Link DSL-2320B is as compliant as the modems leased from your internet provider. D-Link offers a one year warranty with an entire year of free technical support plus they also have a detailed frequently asked questions section on their site to help you do it yourself.